Is i nGaeilg a bheas an cruinniú seo. Cruinniú faisnéise an Satharn 6ú Aibreán i nÓstán Loch Altan, Gort an Choirce ag 11 a.m.
Is feachtas náisiúnta é 'Sick of Plastic' atá á chomhordú ag VOICE Ireland agus ag Cairde na Cruinne chun pobail a nascadh agus a chumhachtú chun gníomhú in aghaidh plaisteach. Beidh Lá Mór Glanadh na mBealtaí i gceantar Chloich Cheann Fhaolaidh ar an Satharn an 13ú Aibreán 2019 ar 1.00in. Beidh Lá Mór Glanadh na mBealtaí i gceantar Chloich Cheann Fhaolaidh ar an Satharn an 24ú Márta 2018 ar 1.00in. idir 9:00 agus 12:00: Ionad Athchúrsála An Chlocháin Léith, Údarás na Gaeltachta, Eastát Tionsclaíochta, An Clochán Liath (074 9522689). Beidh Lá Mór Glanadh na mBealtaí i gceantar Chloich Cheann Fhaolaidh ar an Satharn an 19ú Márta 2016 ar 1.00in. Beidh Lá Mór Glanadh na mBealtaí i gceantar Chloich Cheann Fhaolaidh ar an Satharn an 21ú Márta 2015 ar 1.00in. Féach ar an nasc thíos a thaispeánann na laetha don Bailiúchán Saor in Aisce do Bhruscar Tí Contúirteach atá eagraithe ag an Comhairle Contae. Beidh taispeántas múirín ar siúl sna Tithe Gloine i gCill Ulta ar an Satharn 29ú Meitheamh ar bhuille a 11. Seo uair a chloig eolais ag foghlaim faoi dhéanamh múirín as dramhaíl bhia. Laghdaigh an méid dramhaíl a chuirtear sa bhosca brúscair sa bhaile agus déan múirín le cuir sa gharradh. Beidh araidí múirín de chuid na Comhairle Contae le díol fosta ar €13.00 an ceann. A eagrú ag an grúpa timpeallachta MEAS as Gort a Choirce. Tuilleadh eolais : www.meas-it.com nó 087-6111524. There will be a compost demonstration at Na Tithe Gloine, Cill Ulta on Saturday 29th June at 11 a.m.. This is an information hour of learning how to make compost from food waste. Reduce the amount of waste that goes into the rubbish bin at home and make compost for your garden. County Council compost bins will be on sale at €13.00 each. Organised by the environment group MEAS from Gort a Choirce. Further information: www.meas-it.com or 087-6111524. Ag bailiú: Gníomhaithe Glanadh, agus san áireamh; Tuarthóirí, Sean Leighis agus Cógaisí, Cadhnraí, Frithreoáin, Fiailnimh, Lotnaidicídí, Greamacháin, Seanphéint, Péintdíobhaigh, Aerasóil, Dúigh, Sean Ola. Ní ghlacfar le cannaí péint folamh. Caithfear lipéadú bheith ar achan coimeádán, buidéal, srl agus ábhair inaitheanta go soiléir. Tuilleadh eolais ar an mbailiúcháin saor in aisce seo le fáil ach teagmháil a dhéanamh leis an Rannóg Comhshaoil de Chomhairle Contae Dhún na nGall ag: 074 9176274 nó 9176276. Collecting; Cleaning Agents including bleaches, Waste Medicines, Batteries, Antifreeze, Herbicides (weed killers), Pesticides, Adhesives, Old Paints, Paint stripper/thinner, Aerosols, Inks, Waste Oil. They will not accept empty paint tins. All containers, bottles, etc must be labelled and materials clearly identifiable. For further information on this free collection contact the Environment Section of Donegal County Council on: 074 9176274 or 9176276. Do Tháirgí Leictreachais / Free electrical goods collection in An Fál Carrach. Ba mhaith leis an grúpa timpeallachta Meas Iarthuaisceart gach rath agus bláth a ghuí ar Fhéile Ghort a Choirce i mbliana (2012). Tá súil againn arís bronnadh beag a dhéanamh ar an Baile Fearainn is Slachtmhara i gceantar Ghort a Choirce. Go n-éirí leis an Féile! Beidh taispeántas múirín ar siúl sna Tithe Gloine i gCill Ulta ar an Satharn 14ú Iúil ar bhuille a mheánlae. Seo uair a chloig eolais ag foghlaim faoi dhéanamh múirín as dramhaíl bhia. Laghdaigh an méid dramhaíl a chuirtear sa bhosca brúscair sa bhaile agus déan múirín le cuir sa gharradh. Beidh araidí múirín de chuid na Comhairle Contae le díol fosta ar €13.00 an ceann. Tá an imeacht seo saor in aisce. A eagrú ag an grúpa timpeallachta MEAS as Gort a Choirce. Tuilleadh eolais : www.meas-it.com nó 087-6111524. There will be a compost demonstration at Na Tithe Gloine, Cill Ulta on Saturday 14th July at mid-day. This is an information hour of learning how to make compost from food waste. Reduce the amount of waste that goes into the rubbish bin at home and make compost for your garden. County Council compost bins will also be on sale at €13.00 each. This event is free. Organised by the environment group MEAS from Gort a Choirce. Further information: www.meas-it.com or 087-6111524. Beidh Lá Mór Glanadh na mBealtaí i gceantar Chloich Cheann Fhaolaidh ar an Satharn an 31ú Márta 2012 ar 1.00in. Tá an grúpa timpeallachta MEAS Iarthuaisceart ag iarraidh ar dhaoine gan ábhair mí-nádúrtha ar bith ar nós plaisteach, rubar, boinn rothaí nó brúscar tí a dhóigheadh ar Oíche Fhéile Eoin ná i rith an deireadh seachtaine roimh ré má bhíonn sé á cheiliúradh ag an am sin. Nuair a dhóightear na hábhair seo scaoiltear droch-cheimicí isteach san atmaisféar a dhéanann dochar do sláinte an duine agus is iad cuid de na comhdhúil seo is cúis le hailse. Má chaitear ábhar a dhóigheadh ba cheart adhmad gan ceimicí a dhóigheadh. Cuimhnigh ar na páistí, na hainmhithe agus an dúlra sula lastar aon tinte le bhur dtoil. The environment group MEAS Iarthuaisceart are asking people not to burn any unnatural materials such as plastic, rubber, tyres or domestic rubbish on St. Johns Night or during the weekend beforehand if it is being celebrated then. When such materials are burned Toxic chemicals are released into the atmosphere which are detrimental to human health and some of these compounds are cancer causing. If you must burn any material you should burn untreated wood. Please think about the children, the animals and the natural habitat before any fires are lit. Cleaning Agents including bleaches, Waste Medicines, Batteries, Antifreeze, Herbicides (weed killers), Pesticides, Adhesives, Old Paints, Paint stripper/thinner, Aerosols, Inks, Waste Oil. (Empty paint tins will not be accepted.). All containers, bottles, etc, must be labelled and materials clearly identifiable. See Donegal County Council Recycling FAQs for upcoming FREE Household Hazardous Waste Collection dates. 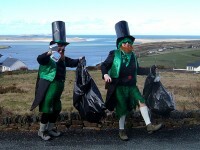 MEAS leprechauns promote anti-litter and respect for the environment. 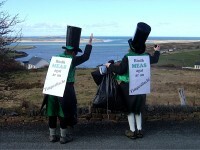 They have been spotted on the St. Patrick Day parades in An Fál Carrach.